LONDON, ENGLAND--(Marketwired - Nov. 8, 2013) - Condor (''Condor" or "the Company") (AIM:CNR), is pleased to announce an updated mineral resource estimate on the La India Project, Nicaragua compiled by SRK Consulting (U.K.) Ltd. The CIM compliant mineral resource now contains indicated mineral resources of 9.6Mt at 3.5g/t Au for 1.08 million ounces of gold and inferred mineral resources of 8.8Mt at 4.4g/t for 1.25 million ounces of gold reported to NI 43-101 standard. In addition, there is 2.68 million ounces of silver at a grade of 6.2g/t estimated on the La India and California Veins, and the historic America Mine, only where there is sufficient silver assay data. Total open pit mineral resources of 1.14M oz gold at 3.1g/t comprising La India Open Pit 921,000 oz at 3.0g/t, America Open Pit 160,000 oz at 4.2g/t and Central Breccia Open Pit 57,000 oz gold at 1.9g/t (cut-off grade 0.5g/t). Total underground mineral resource of 518,000 oz gold at 5.4g/t (cut-off grade 2.0g/t over 1m). Total mineral resource of 673,000 oz gold at 5.5g/t not yet tested with Whittle open pit model (cut-off grade of 1.5g/t). "Overall, I am pleased with this resource Update. It shows that the mineral resource in the higher indicated category of confidence has increased by 43% to 9.6Mt at 3.5 g/t for 1.08M oz gold. The total open pit resource has increased 20% to 1.14M oz gold at 3.1g/t with the identification of two open pits on the America of 160,000 oz gold at 4.2g/t gold and Central Breccia of 57,000 oz gold at 1.9g/t gold. The potential feeder pits complement the main high grade La India open pit resource of 921,000 oz gold at 3.0g/t gold. Furthermore, La India Project Mineral Resource remains broadly unchanged at 18.4Mt at 3.9g/t for 2.33M oz gold and a small silver resource of 2.68M oz silver at 6.2g/t silver. The main La India Open Pit resource is now much more robust following an additional 14,000m of infill drilling. The original resource was compiled from a combination of underground grade control samples and drill assay results from previous Soviet and Canadian sponsored drill programmes. Condor's drilling has resulted in a slight repositioning of the depletion zones of the historic mine and a more accurate mineral resource estimation confined by a whittle pit shell, using updated geotechnical pit angles, mining dilution factors, recovery rate and other estimated operational costs. La India Open Pit resource may increase in size once the hydrogeology is completed and the pit angle may also improve 1 to 3 degrees, thus driving the pit deeper." 13,956m of infill drilling on the La India Open Pit Area has converted inferred mineral resource ounces to the more confident indicated category and 1836m of geotechnical drilling has improved the accuracy of the Whittle open pit model. 2,680m of follow-up drilling on the Central Breccia has been used in a Maiden open pit resource estimation. The Updated Mineral Resource represents a significant advance towards a pre-feasibility study ("PFS") with an increase in the open pit mineral resource and the conversion of a large part of the mineral resource to indicated level of confidence as required for inclusion in a PFS (Tables 1-3 below). 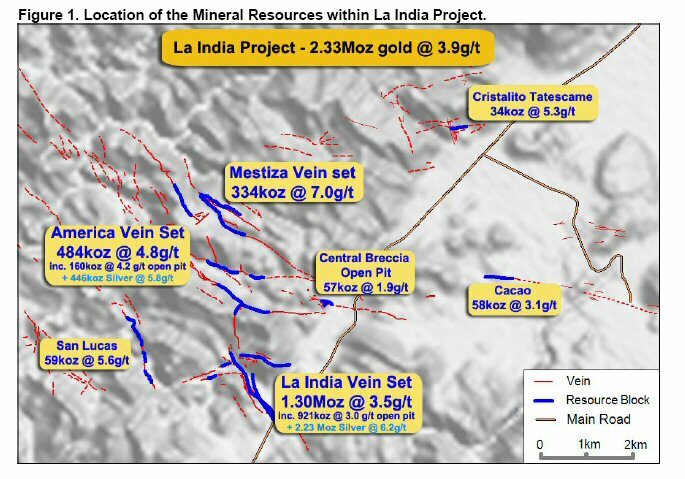 The latest drilling at La India Project has targeted areas with open pit potential within the 6km by 3km core of the project area and has successfully increased the in-pit gold resource from 954,000 oz, located only in one location, to 1.14 million oz at 3.1g/t gold in three close-spaced pits: the 921,000 oz La India Open Pit, the 160,000 oz America Open Pit and the 57,000 oz Central Breccia Open Pit resources. The addition of the two smaller pits will add flexibility to a future open pit mining operations. The La India Open Pit Mineral Resource estimate of 921,000 oz gold remains largely unchanged from the previous, predominantly inferred mineral resource estimate, but now contains 838,000 oz gold at a grade of 3.1g/t in the indicated level of confidence within the Whittle open pit shell. Drilling on La India was primarily designed to convert inferred mineral resource that fell within the optimised Whittle open pit shell to the more confident indicated mineral resource category required for inclusion in a PFS. The 50m spaced infill drilling has resulted in a more robust mineral resource model with most of the in-pit resource assigned indicated level of confidence due to the greater confidence in continuity of mineralisation between drill holes. However, some more geologically complex areas have been identified which will require further closer spaced infill drilling to allow a geological interpretation at indicated level of confidence. An additional 381,000 oz gold, including 98,000 oz of indicated mineral resource, lies outside of the Whittle pit shell and has been estimated using underground mining parameters. An optimised Whittle Open Pit mineral resource of 1.18Mt at 4.2g/t for 160,000 oz gold has been estimated on the America Vein Set. The Open Pit Mineral resource includes 226,000t at 8.4g/t for 61,000 oz gold in the indicated category and a further 957,000t at 3.2g/t for 99,000 oz in the inferred category. An additional Indicated Resource of 358,00t at 6.83g/t for 78,000 oz gold falls outside of the optimised Whittle pit shell and has been estimated using a higher cut-off grade of 2.0g/t to reflect the higher costs of anticipated underground mining. This new open pit mineral resource combined with the updated mineral resource on the America-Escondido and Constancia veins (together referred to as the America Mine Mineral resource), and the existing mineral resource on the Guapinol Vein results in an updated mineral resource estimate of 585,000t at 7.4 g/t for 140,000 oz gold within the indicated category plus 2.55Mt at 4.2g/t for 344,000 oz gold in the inferred category for the America Vein Set. This maiden open pit component of the mineral resource is built around the historic underground mine workings and includes remnant wallrock mineralisation in the historic America Mine discovered in the recent drilling campaign. The optimised Whittle pit shell reaches a maximum depth of 140 m below surface to exploit a 200m down-dip extent in a structurally complex zone where three vein directions intersect; the Constancia Veins intercept a 60° flexure in the America-Escondido Vein. The development of wider veins and quartz breccia zones at this structurally complex zone has resulted in some wider zones of gold mineralisation modelled as amenable to open pit mining. The remaining Whittle open pit mineral resource covers shallow mineralisation typically to a depth of 50m along 2000m strike length of the America and to a lesser extent the Constancia veins. A maiden open pit inferred mineral resource estimate of 939,000t at 1.9g/t for 57,000 oz gold has been completed on the Central Breccia based on 2,669m of drilling and 1,400m of trenching completed by Condor since the Company geologists discovered the Central Breccia in 2011. The style of gold mineralisation is unusual for the La India Project: the gold mineralisation is hosted by a hydrothermal calcite breccia with high-grade gold mineralised zones associated with internal zones of intense argillic alteration and sulphide mineralisation within a low-grade background halo. The breccia forms a broadly funnel shaped body with maximum lateral extent of 270m at surface, interpreted to narrow at depth. Drilling has intercepted gold mineralisation at a maximum depth of 150m below surface, however the depth extent remains untested. The entire resource, which forms a distinctive steep sided hill, falls within a low strip ratio Whittle Pit shell. However lateral continuity of the high-grade zones is on a 10's of metres scale, which means that the mineral resource has been assigned inferred status and would require further drilling to convert to the indicated level of confidence. (6) SRK Completed a site inspection to the deposit by Mr Benjamin Parsons, MSc (MAusIMM(CP), Membership Number 222568, an appropriate "independent qualified person" as this term is defined in National Instrument 43-101. (6) SRK Completed a site inspection to the deposit by Mr Benjamin Parsons, MSc, MAusIMM (CP), Membership Number 222568, an appropriate "independent qualified person" as this term is defined in National Instrument 43-101. The Mineral Resource estimate has been completed by Ben Parsons, a Principal Consultant (Resource Geology) with SRK Consulting (UK) Ltd, who is a Member of the Australian Institute of Mining and Metallurgy, MAusIMM(CP). Ben Parsons has some thirteen years' experience in the exploration, definition and mining of precious and base metal Mineral Resources. Ben Parsons is a full-time employee of SRK Consulting (UK) Ltd, an independent Consultancy and has sufficient experience which is relevant to the style of mineralization and type of deposit under consideration, and to the type of activity which he is undertaking to qualify as a Competent Person as defined in the June 2009 Edition of the AIM Note for Mining and Oil & Gas Companies. Ben Parsons consents to the inclusion in the announcement of the matters based on their information in the form and context in which it appears and confirms that this information is accurate and not false or misleading. Diamond core drilling A drilling method in which penetration is achieved through abrasive cutting by rotation of a diamond encrusted drill bit. This drilling method enables collection of tubes of intact rock (core) and when successful gives the best possible quality samples for description, sampling and analysis of an ore body or mineralised structure. Dip A line directed down the steepest axis of a planar structure including a planar ore body or zone of mineralisation. The dip has a measurable direction and inclination from horizontal. Quartz breccia Broken fragments of rock cemented together by a network of quartz rock. The quartz is deposited from saturated geothermal liquids filling the space between the rock fragments. Quartz veins Deposit of quartz rock that develop in fractures and fissures in the surrounding rock. They are deposited by saturated geothermal liquids rising to the surface through the cracks in the rock and then cooling, taking on the shape of the cracks that they fill. Resource block A 3-Dimensional model of the ore/mineralised body containing a Mineral resource estimation. Trench The excavation of a horizontally elongate pit (trench), typically up to 2m deep and up to 1.5m wide in order to access fresh or weathered bedrock and take channel samples across a mineralised structure. The trench is normally orientated such that samples taken along the longest wall are perpendicular to the mineralised structure.